My mom had a great cinnamon roll recipe when we were growing up. She found it in a Kahlua recipe pamphlet. A little alcohol makes everything tastier :). 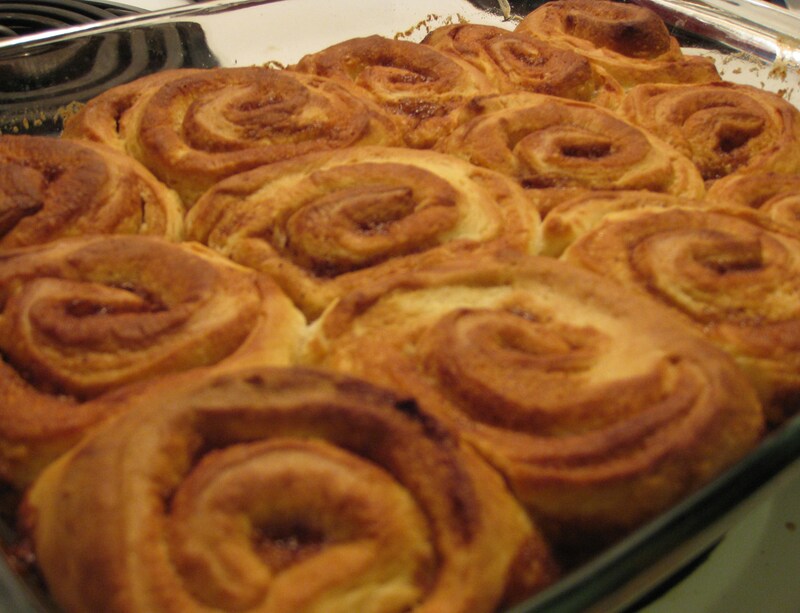 I used to love waking up to the smell of cinnamon rolls baking, and the rolls were always devoured quickly. (My mother is clearly not one of these moms) Sadly, somewhere along the way she lost the recipe (and a lot of other great Kahlua recipes, boo!). So my plan with these cinnamon rolls was to recreate that recipe. I used Anna Olson’s Sticky Bun dough, and attempted to reinvent the filling. It worked out pretty well,. The dough is great, it’s easy to make and yields a soft fluffy bun. I think the cream cheese is the secret. I just don’t know why. And the filling is pretty close to what I remember. I brought them to an office breakfast and they were all gone by the end of the day. Ok fine, I had to push them on to some people at the end of the day, but no one seemed to mind. Using a mixer, dissolve yeast in water and allow to sit for 5 minutes. Add milk, egg and sugar and blend. Add flour and salt and mix for 1 minute to combine. Add butter and cream cheese and knead for 5 minutes on medium speed. Place dough in a lightly oiled bowl, cover and let rest 1 hour. While the dough is resting, combine all the filling ingredients in a saucepan. On medium heat stir till the butter has melted. Pour half the filling mixture in a 9 by 13 in baking dish. Put the rest of the filling in the fridge to cool until the dough is ready. Once the hour is up, on a lightly floured surface roll the dough into a rectangle, about 1 cm thick. Spread the remaining filling on the dough. Roll lengthwise. Slice the dough into 12 pieces and place them on the baking sheet. This method is not exactly what I did. I poured the warm filling over the rolled out dough. Disaster. As soon as I started to roll the dough, the filling started to ooze out. It got even worse when I sliced the rolls. I salvaged some of the filling and just poured it into the pan, but a lot of the rolls didn’t have enough filling. I think cooling the filling to a spreadable consistency will solve this problem. Thankfully, there was enough delicious goopiness at the bottom of the rolls to save the day.